Dont settle for a plain fireplace mantel or surround. Choose an exquisite marble fireplace instead. The look achieved with natural stone is one of a kind. Below are five beautiful marble fireplace examples. Keep in mind that these are just examples. If you choose to install a marble fireplace, each element can be customized to your liking. This beautiful marble fireplace, shown below, contains stunning detailed elements that truly create an elegant look. The curved scroll work on the sides of this fireplace frames it perfectly. This traditionally styled fireplace, shown in the picture below, features a uniquely carved scalloped mantel. This hand-carved limestone fireplace has a deep mantel and hearth; perfect to display urns or photos on. 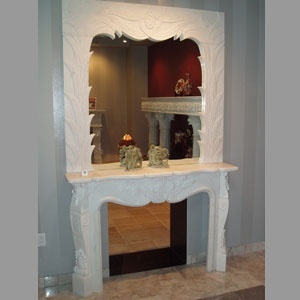 The crisp white of this hand-carved white marble fireplace surround helps to highlight the unique detailed carvings. The overmantel contains a mirror flanked with beautiful leaf details. This French Country style fireplace, pictured below, features a beautiful carved marble rose festoon that rests above the gas fireplace opening. The marble hearth is uniquely shaped to mirror the serpentine mantel shelf above. This stunning fireplace surround is carved from Michelangelo marble. The uniquely colored marble along with the classic shape of this fireplace creates a breathtaking piece. This marble fireplace features a variety of earth tones including: black, brown, tan and white. Marble is an exquisite material that works perfectly in a fireplace surround. If you want detailed carvings in your fireplace, marble is the perfect material. As stated previously, fireplaces can be designed and customized to fit the style of your home perfectly. Need more fireplace design inspiration? Check out our ideas gallery. Get some more design inspiration; download our free fireplace design guide.